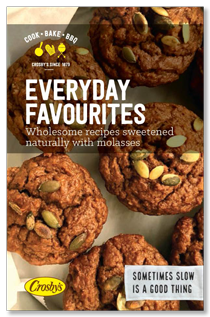 Make a healthy version of an old-time favourite: Fudgy brownies, filled with zucchini, flax and whole wheat flour. 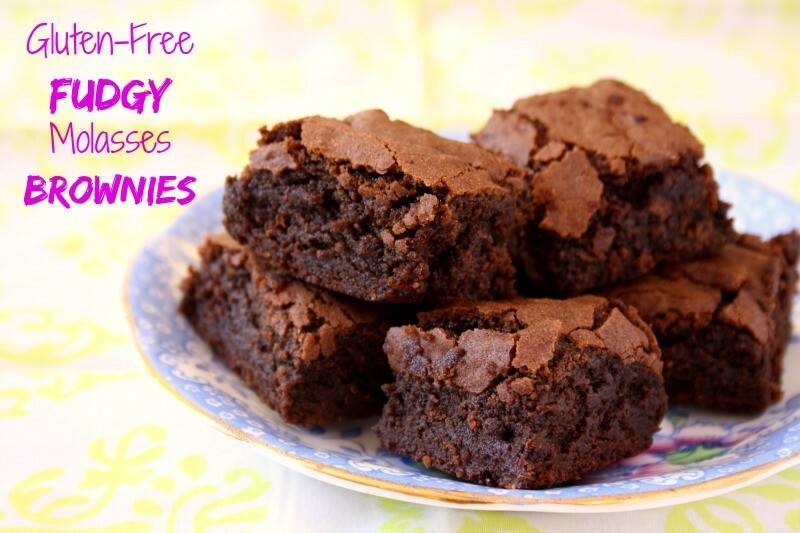 These are healthy compromise brownies. 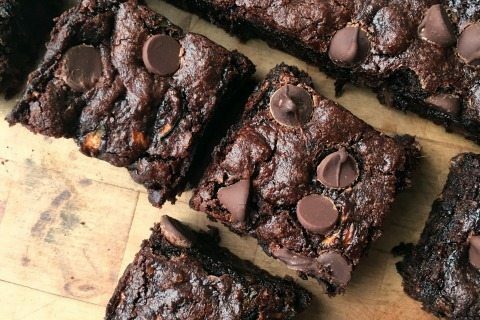 They’re sweet and fudgy but made healthier with zucchini, ground flax, whole wheat flour and much less sugar than your average brownie recipe. Molasses helps to make them taste more chocolaty and chocolate chips add nuggets of sweet and extra texture to each bite. Baking with vegetables is a good way to add nutrition to your brownies, cookies and muffins, and vegetables help to keep baked goods moist. Zucchini is versatile because it is tender and doesn’t have a lot of flavour on its own. 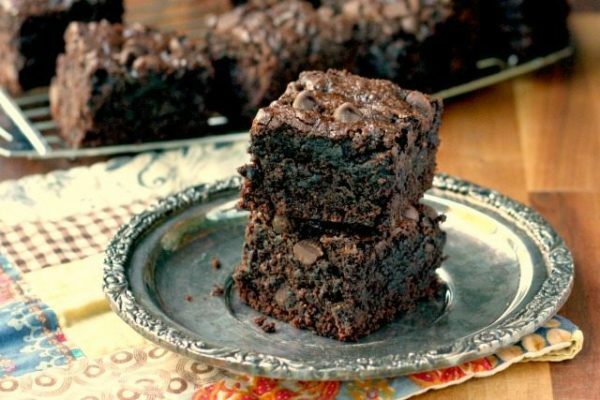 And if you like to count calories, you’ll find these zucchini brownies are filling at just 106 calories each. 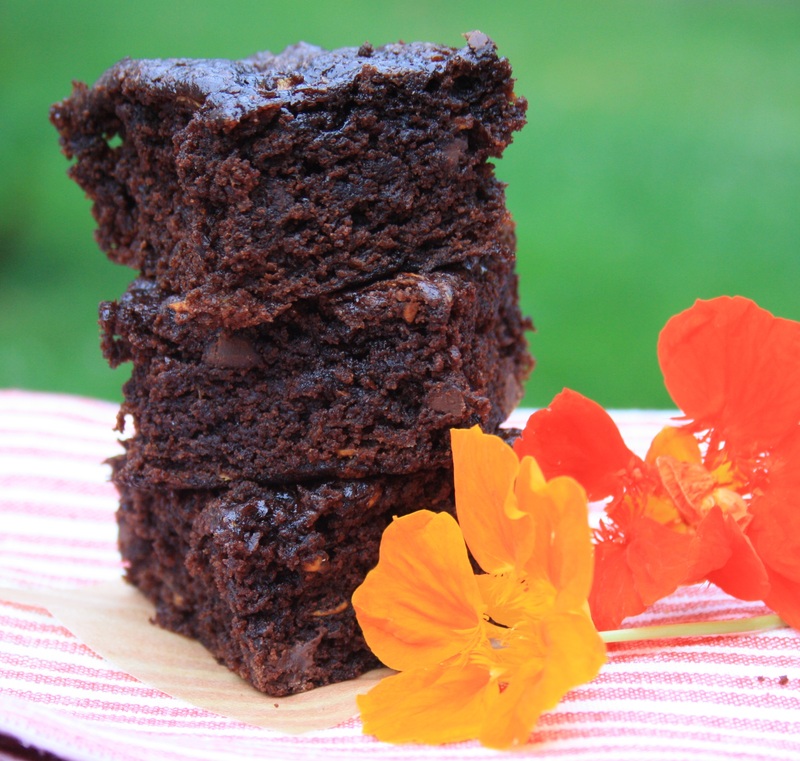 Healthy zucchini brownies have become a school lunchbox treat for the final few weeks of school. With all of us tired of the school lunch routine (and school in general), easy treats like this create a nice diversion. They’re also easy for kids to bake on their own. You’ll be tempted to bake them longer than 40 minutes. 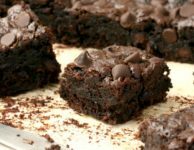 If you want fudgy brownies, stick to the 35-40 minute range. They’ll still be yummy if you bake them for 45 minutes, but they’ll be more cake-like. 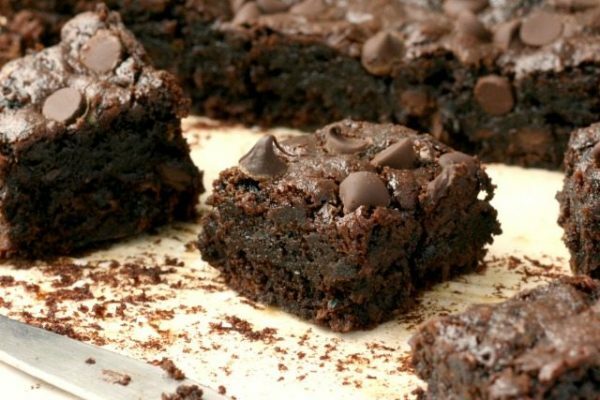 This recipe is adapted from an earlier recipe for Zucchini Brownies posted on this website. Line a 9”x 9” pan with parchment paper or grease it well. Whisk together butter, sugar, vanilla and molasses. Add egg and mix well. In a separate bowl, whisk flours, flax, cocoa powder, baking soda and salt. Fold in the zucchini and ½ a cup of the chocolate chips. Spread in prepared pan. Sprinkle over remaining 2 Tbsp. of chocolate chips and press them in a bit.  *Grate the zucchini on the large-hole side of a box grater. A handful at a time, squeeze out as much liquid as possible. Nutritional info: Per brownie (when made with butter). Ok, so this is a yummy way to use the garden zucchini. :) Now to just stay with eating one brownie. A useful use for zucchini! 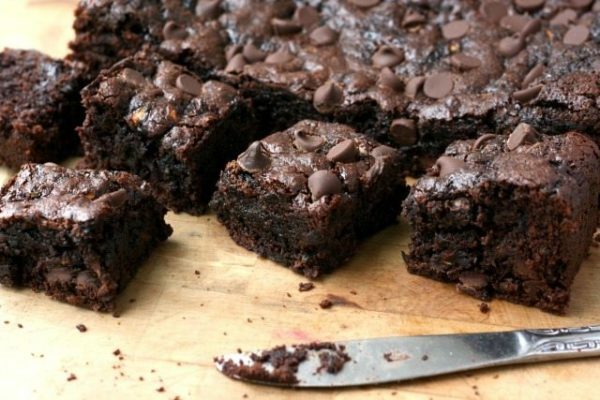 It is not easy to just eat one brownie. I like to give some away to neighbours, it saves me from eating them all. Have you tried it with honey or maple syrup? Hi Wendy. I haven’t tried this recipe with honey or maple syrup but I bet it would be delicious.